Facing your shadow, under the moonlight. 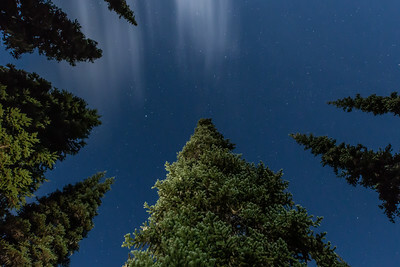 Trees, under the stars, reaching up towarrd the sky. 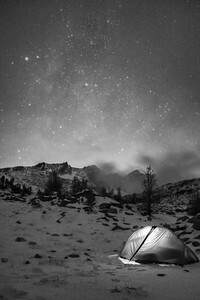 I could have been warm and sleeping in that tent right there, but when the sky cleared I jumped at the chance to capture this photo. What are these streaks acoss the sky? They're the trails of the fairies and pixies that inhabit the Enchanments. Or maybe they were the larch tree needles blowing in the wind. Either way, I thought they were cool. 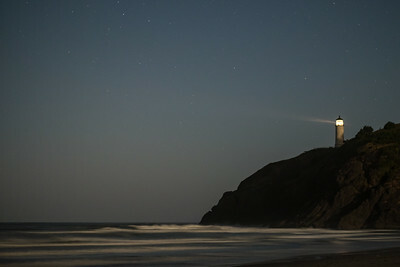 Looking Northeast, the star almost directly above Prusik Peak is Capella, part of the Auriga constellation, third brightest star in the Northern sky. And that patch of darker sky to the right of it is a bit of the Milky Way trailing off... And a little further to the right is the infamous Pleiades cluster in the constellation Taurus, with millenia of lore surrounding it. 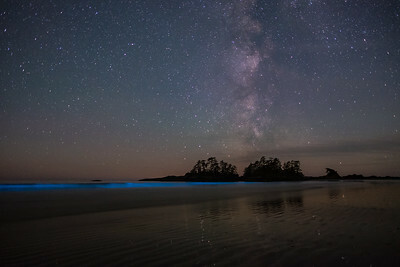 The Enchanted World - as witnessed in the magic of Tofino, a tall and bright Milky Way visible across the entire sky, while blue, glowing, bioluminescent waves crash on the beach below next to stars glimmering in the wet sand. 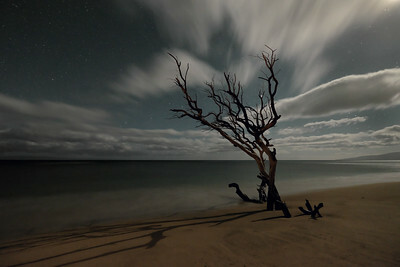 I spent most of the night alone, right here in this spot. 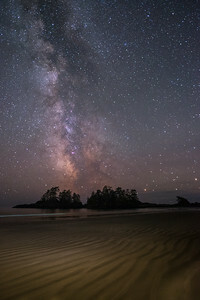 Tofino is magical all around, and has some of the darkest skies I've seen on the PNW coast. This night I was on the beach mostly alone aside from a bonfire or two, soaking in the silence and mystery and looking out across the whale tail shaped landscape of Chesterman's beach toward Frank island. The waves were glowing, bioluminescense, but I didn't realize it until later, after this photo, and I did manage to get a photo of that too. 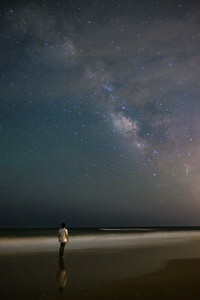 Self-portrait under the Milky Way from Figure 8 Island. 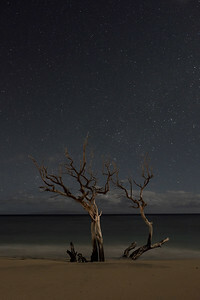 We were looking for ghost crabs after dark when my daughter pointed out the Milky Way above. 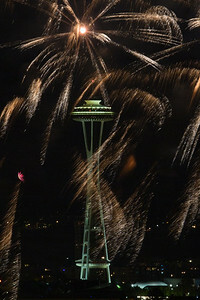 I decided to capture it the next night, but since there wasn't much foreground, I went for a self-portrait. The light from Wrightsville Beach was leaking in from the right, and wispy clouds were scattered through the sky. 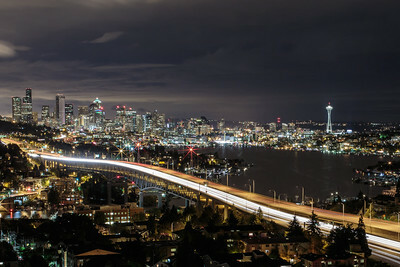 This is a single exposure with the Fuji X-T1, 16mm at 2.0, ISO 1250, 20 seconds, and a bit of patience. 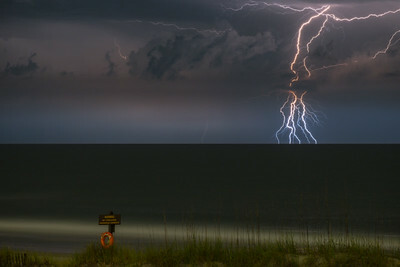 Mother Nature's display of energy off the coast of Figure 8 Island, North Carolina. 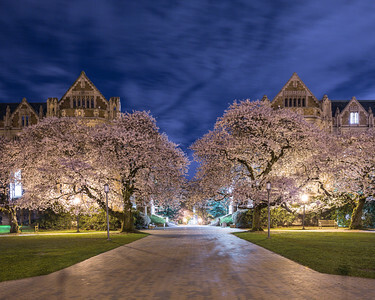 From March 2015, when the cherry blossoms were 'a blossoming on the UW campus. Night time was the quiet time to be here. 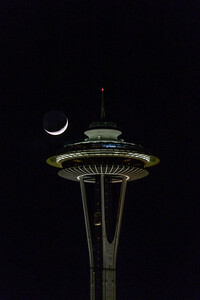 Space Needle and Black Moon last night. 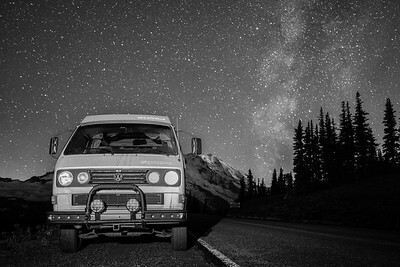 A little camping high up, under the stars. 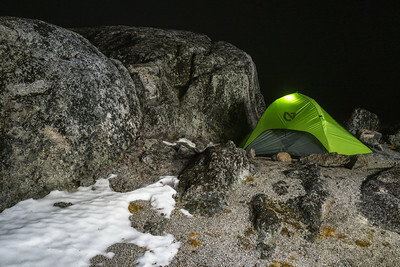 It was pretty darn cold, so much that I couldn't stand but about 10 minutes out of the tent. 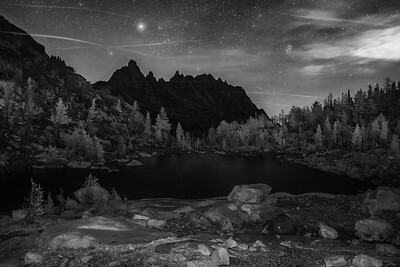 But it was nice to be the only people up in the Enchantments, a rare solitude, with a little Milky Way barely visible in the background. We had a fun time in the mountains at the North Cascades Institute family weekend. And of course since the trip was during a new moon I had to get out and see what the stars and Milky Way looked like. The girls were too tired to make it out so I ventured alone. 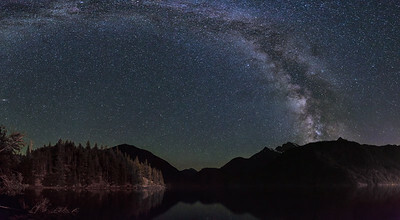 This photo is a stitch of 5 photos, looking out across Diablo Lake. That's Colonial Peak off to the right and a little bit of Pyramid next to it. The light on the trees is from the dam behind me. 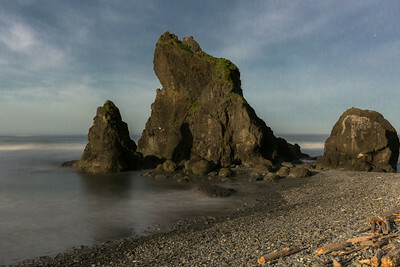 On the night of a full moon on the Olympic Coast's Ruby Beach, my buddy Todd and I stayed out for too long as the high tide rose up to create a river that trapped us. At midnight, we realized we'd be stuck at least three more hours until the tide pulled out and the river receded enough that we could cross. 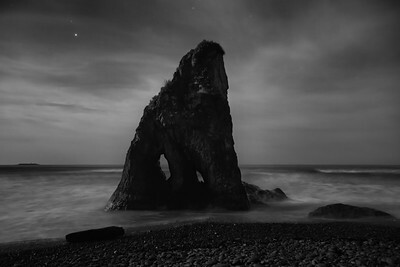 As the moon and tide continued rising, this lone seastack seemed from another world, or another time. 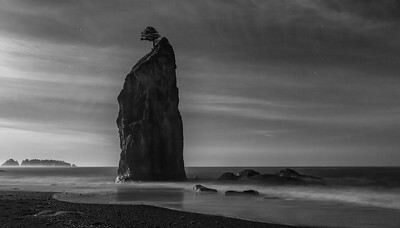 From a full moon lit landscape at Ruby Beach, the Shadow Doorway opens upon the rock. 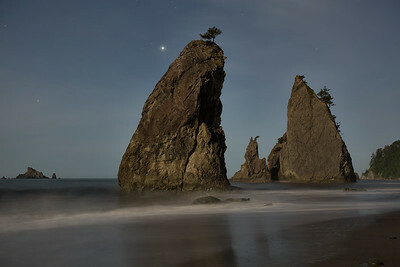 On a full moonlit night near Forks, WA, I looked at this incredible seastack and stood back in awe while considering all the geological changes Mother Earth has gone through over the millenia. It reminds me of a story from Plato's Timaeus, where a young Solon travels to Egypt, and meets one of the elder priests. The priest tells him that the Greeks are like children, their minds never mature, they've forgotten the customs and wisdom of their ancestors. He goes back to 9000 years earlier, when he says the Greeks were a great and mighty people, but as the Earth goes through periods of catastrophic fire and flood, the only survivors are the uncivilized and illiterate who live far from the concentrated populace. Time and again, our past is lost. Records, customs, knowledge, and wisdom, are forgotten as humanity is rebuilt. However, there is a temple in Egypt, the priest tells Solon, where such records have been preserved for many thousands of years, and our most ancient history is not forgotten. 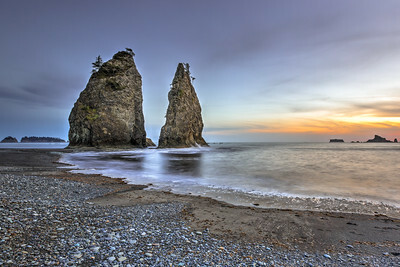 In this image I wanted to improve the main subject, the two sea stacks. By creating a square crop I felt they became more prominent, and I also brightened the shadow detail to make them more visible. Those were the major changes and beyond that I used the spot removal tool to get rid of some debris in the bottom center edge. 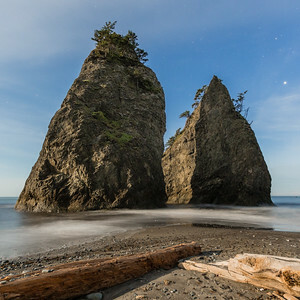 I also wanted to position the two pieces of drift log so they retained their "V" shape, parallel to the shape of the sand and water, and leading into the V shape of the sea stacks themselves. 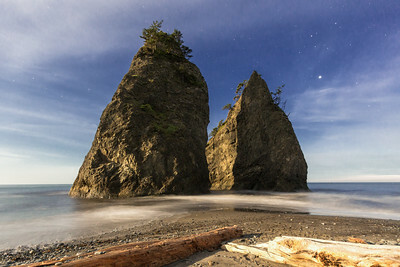 Another look at some Olympic Coast sea stacks, lit here by full moon light and a mostly set sun. 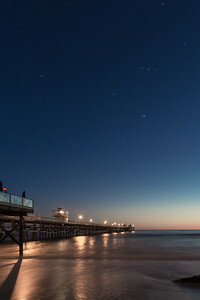 Todd and I were walking along the beach, and while I was oblivious to this view, Todd stopped to look and ponder. I'm glad he did, I see it now - Plato was right, the Universe is made of triangles. 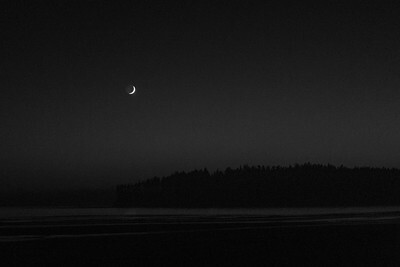 Crescent moon over Hobuck Beach, Northwestern-most tip of the continental US and home to the Makah Indian Tribe for thousands of years. 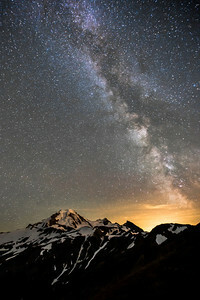 Camping out near Mount Rainier under a new moon and starry sky, watching the Milky Way quickly traverse the horizon. 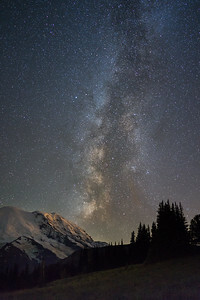 This weekend at Mount Rainier the sky was full of clouds until around 8pm Saturday night when the clouds cleared and a bazillion stars came out. 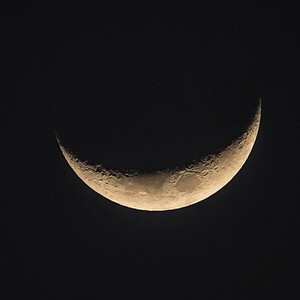 It was close to the new moon so no moonlight to interfere, and no city light pollution for miles. 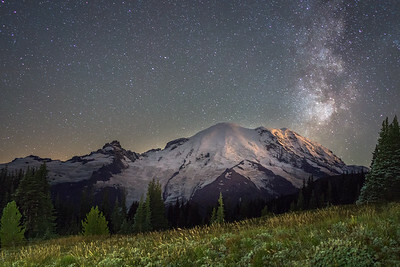 The Milky Way appeared around 9pm, and slowly moved across the sky and Rainier until it was in this position around 1 a.m.
Another photo from stargazing near the meadows of Rainier. The Milky Way was exploding off the Western face, and you can see the headlamps from midnight hikers on the Eastern ridge. 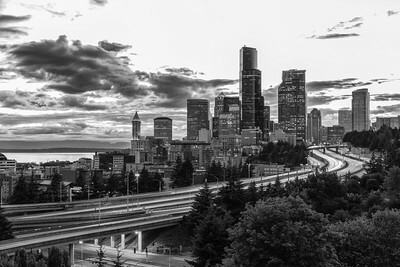 This photo taken with the Sony RX1R, most incredible digital camera ever! ISO 3200, 20 seconds, F2.0, 35mm. From the beautiful North Cascades National Park in WA. 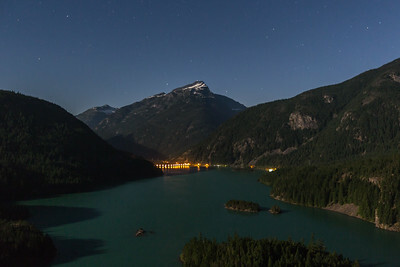 Diablo lake was dammed up almost 100 years ago, part of a massive glacial river. 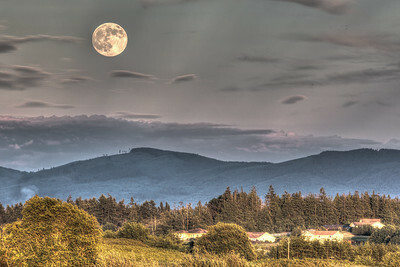 This view is looking out from the overlook on a full moonlit landscape in July. 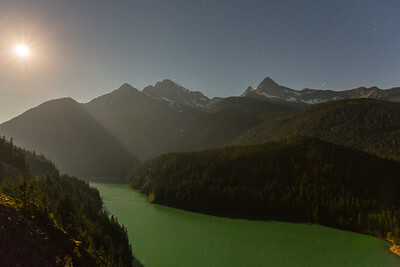 From Diablo Lake, looking across to Colonial and Pyramid peaks, during the full moon. 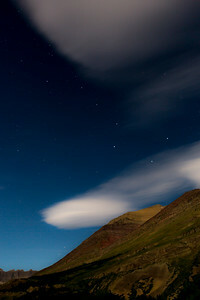 The Big Dipper from Many Glacier Lodge. 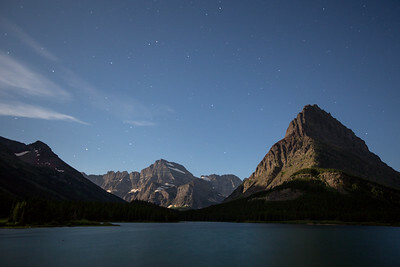 The light here was cast by the full moon, and the long exposure opened up the camera to see details across the landscape at Mount Grinnel, Glacier National Park.